The year 1998 was a heavy snow year. Almost twice the normal rain fell in my hometown of Fresno. Winter and spring views of the snow-covered Sierra Nevada were splendid and the snow stuck on the higher slopes well into August. 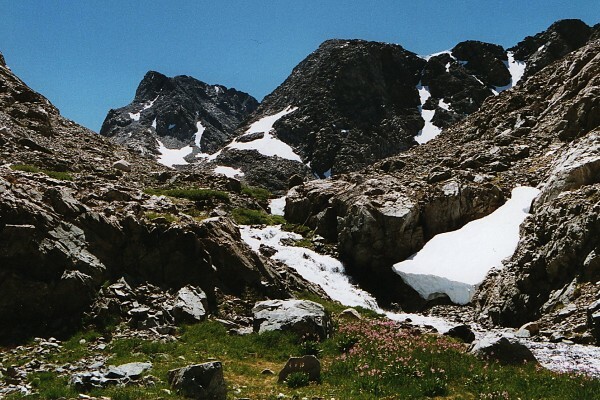 Toward the end of June, I had a chance to check out the snowpack up close from the summit of Mitchell Peak, which is located on the southwest boundary of Kings Canyon National Park. The trail on the north slope of the peak was mostly snow covered and the flatter parts of the summit were covered as well. The view of the Kaweahs and the Great Western Divide were spectacular and every pass in view was snow covered. Cross-country travel would be difficult. 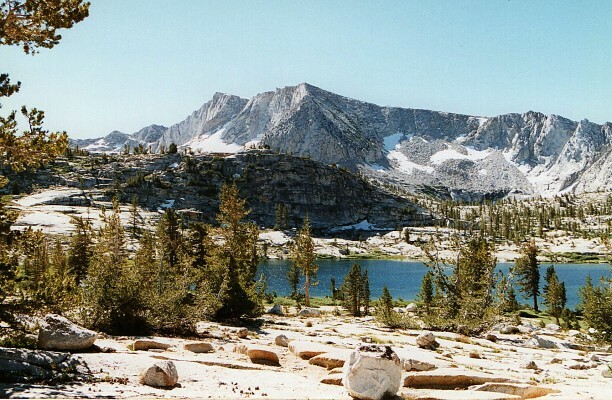 On July 22, I took a short trip to Dinkey Lakes Wilderness. 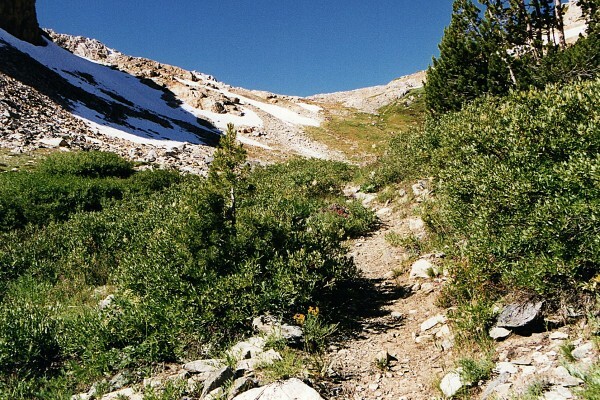 Despite its low elevation, much of the trail to First Dinkey Lake was snow covered. It looked like I would have to put off serious hiking until August. The summer became more hectic as I became involved in various projects and before I knew it, the last weeks of August had arrived. I was so busy on departure day that I was unable to drive toward the trailhead until around noon. I picked up a wilderness permit in the new National Forest offices in Prather and arrived at the Maxson trailhead near Courtright Reservoir at around three in the afternoon. By dinnertime, I had arrived at the creek crossing at Post Corral Meadow. A sign on the other side of the creek pointed the way to the pass. Since there was plenty of light and I had a long way to go, I continued toward Red Mountain Basin after dinner and camped near the trail about halfway toward the ridge above. Since there was no water nearby despite the wet winter, I conserved my water supply knowing that I might not find any drinking water until I got near Fleming Lake. I had left my water filter at home since it was plugged up, so I had to be especially careful when choosing water sources. I needn't have worried about water since streams were running, albeit lazily, up on the ridge. Although the trail up the ridge to Fleming Lake travels through forest, there are breaks in the trees that invite the curious hiker to take a look at where he is headed. From one such break, I spotted Red Mountain and Hell for Sure Pass on the horizon. Red Mountain and Hell for Sure Pass - A quick side trip out of the forest on the ridge leading to Fleming Lake allows a view of Red Mountain and Hell for Sure Pass on the Horizon. By mid-morning, I arrived at Fleming Lake and took some photos during a short break. There wasn't a cloud in the sky, very unusual for this area. I couldn't remember the last time I had been here and not had rain or heavy cloud cover. Just beyond Fleming Lake, the way to Hell for Sure Pass was clearly marked by a trail sign. Shortly thereafter, I passed another sign showing the route to Dale Lake, a place were I have spent several enjoyable days in the past. I took another photo break at Disappointment Lake then pushed on toward Hell for Sure Pass. 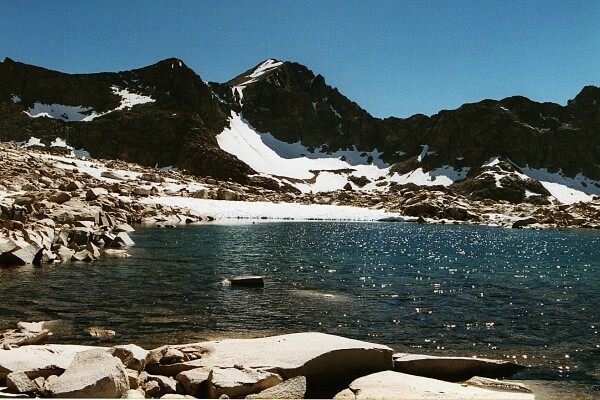 Disappointment Lake, another misnamed feature of the Red Mountain Basin. I passed by several lovely, shallow lakes during the approach. As I reached the base of the pass, Hell for Sure Lake was lovely as usual. The trail was in pretty good shape considering how much snowmelt had flowed over it. Before I knew it, I was on top looking into Goddard Canyon and at the divide separating it from Evolution Valley. Vegetation was unusually abundant although the season was late because of heavy snow. Parts of the trail were hidden by snow, but cross-country detours were not difficult. Pink heather was denser than usual around the boulder fields of the upper pass. The trail descended deeper into Goddard canyon and I soon found myself at the poorly marked junction with the trail that comes up the canyon and continues toward Martha Lake. I continued up the trail a little while more, then stopped at a small packer's camp (horse food and flop nearby) near the creek. Looking down Goddard Canyon through morning haze from the second night's camp. The next day dawned as clear as the day before and I ate and packed quickly with the knowledge that I would be seeing new territory that morning. As I ascended the canyon, I noticed a break in the cliffs to the east and decided to head toward Davis Lakes through it rather than hiking all the way to Martha Lake as I had planned. The route was straightforward across meadows and through forest and soon I found myself on a bench covered by dozens of shallow lakelets. Route to Davis Lakes - The route I chose led through forest and the gap above onto a lake-studded bench. Looking over my shoulder, I could see dark Mount Goddard dominating the skyline to the south. The clear skies offered an excellent view of the striped mountain across Goddard Canyon. 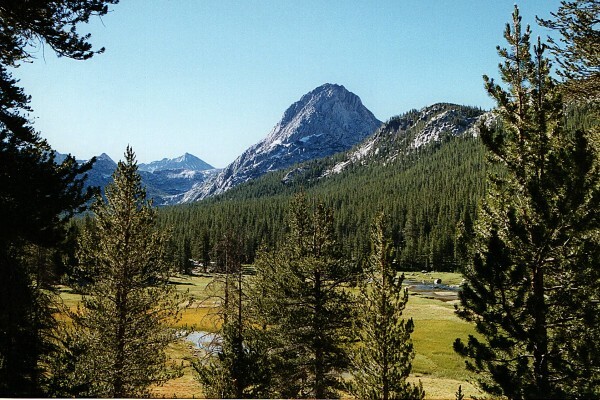 By mid-morning, I caught my first glimpse of Davis Lakes. The route through the basin was not entirely visible when I first saw the lakes. I was tempted to turn around and go home when I saw the steep shoreline and fields of snow I would have to traverse. At first glance, I was disappointed because it looked like I wouldn't be able to get around the lake because of heavy snow cover. Finally, I decided that I needed to check it out a little closer, so I descended into the valley that drains the lakes, crossed the roaring creek, and moved up the slope to the north shore of Davis Lakes. Davis Lakes Outlet Stream - The descent to this stream looked difficult but turned out to be routine. Somehow the beauty of this area bouyed my spirits and helped me continue. As I got closer, it didn't look nearly as difficult so I continued along the shore, crossing several snowfields and lots of talus. 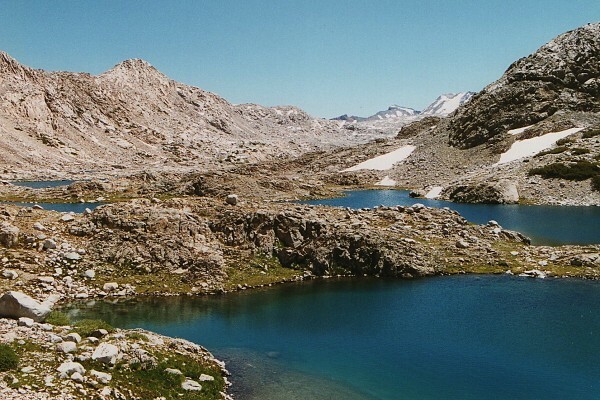 Davis Lakes - Although the basin seems devoid of life, it is starkly beautiful. 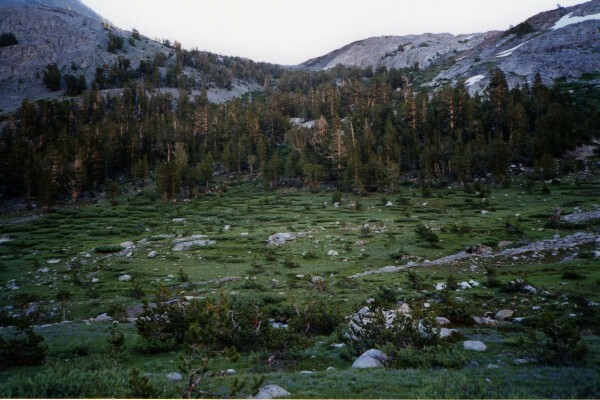 The basin was free of all but low-lying vegetation. A strip of green on the shore, about the only life here. The dark volcanics of the Goddard massif dominated the views to the south while the low granite ridge to the east invited me to cross into Evolution country. Mount Goddard from the saddle to Wanda Lake - A shallow tarn adorns the crossing to the Evolution Creek drainage on the other side. 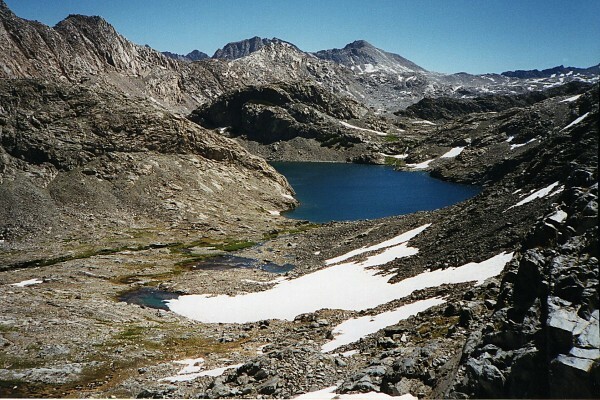 and Wanda Lake and Muir Pass to the southeast. Wanda Lake from the saddle - Even though it was late August, a little snow floated on the surface of Wanda Lake. 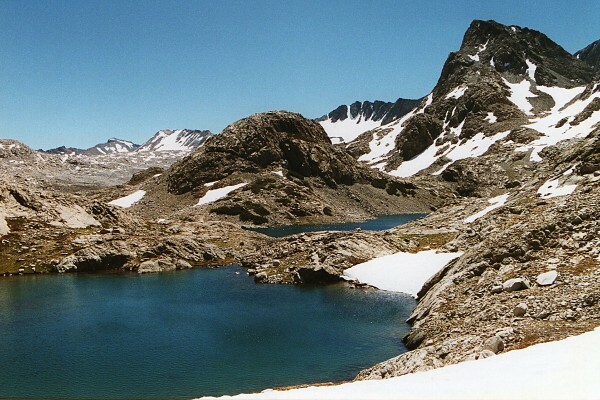 After a short break, I descended to the outlet of Wanda Lake which was congested with a dozen or so hikers frolicking in the snow melt that filled Wanda Lake and its outlet stream. 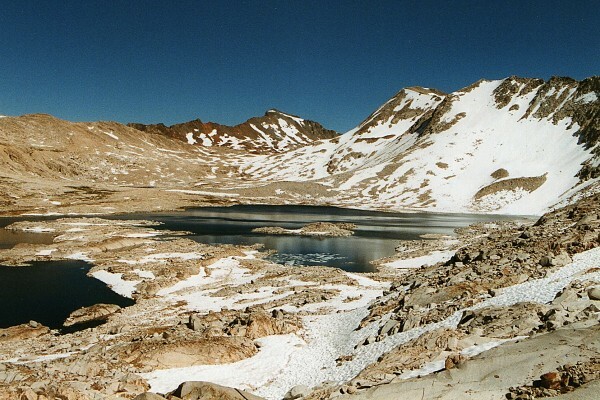 Parts of the John Muir Trail (JMT) were snow covered but it wasn't difficult to find a way down the valley. 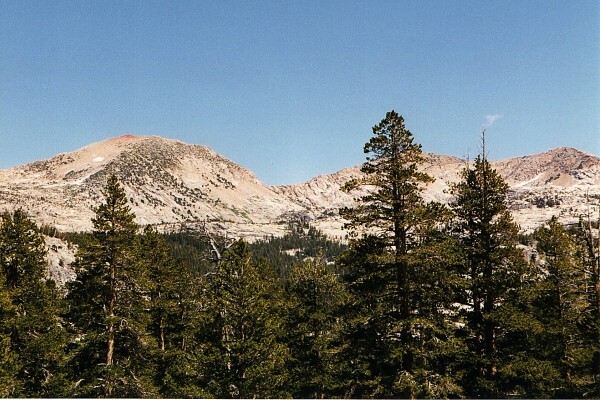 Glancing back up the JMT, the snow pack appeared even heavier than it had from higher viewpoints. 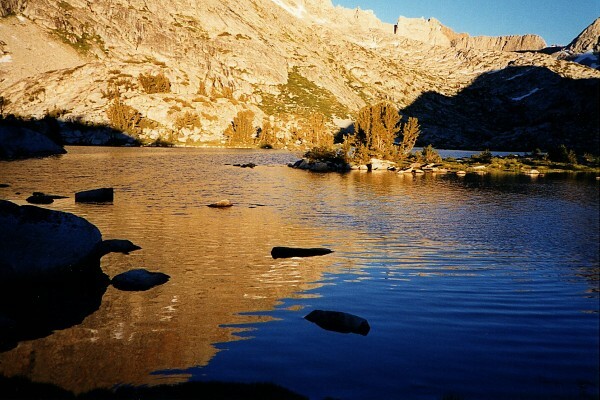 As the shadows lengthened, I arrived at the ford of the inlet to Evolution Lake. 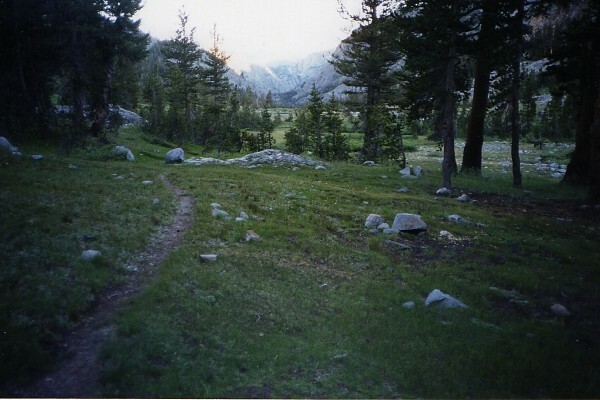 Ten years earlier while hiking the JMT, this had been one of my least favorite water crossings because I had slipped and soaked my boots. The crossing was equally memorable this time because trail crews had built an excellent and tasteful "bridge" across this tricky area. Ford Across Evolution Lake Inlet - A truly beautiful crossing built by an excellent trail crew. Rockwork on the approaches showed the pride and careful craftsmanship that characterizes rockwork on modern trails. 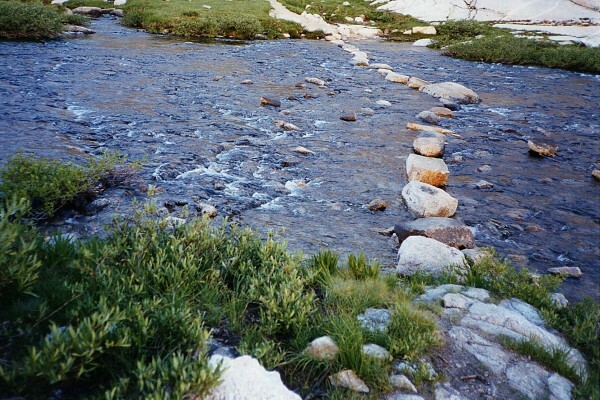 Every rock on the bridge was steady making the crossing doubly pleasant. After a short break, I continued around the north shore of Evolution Lake, noting that since my last visit, the trail had been moved from the fragile meadows fringing the lake to talus fields above. A perfect campsite near the outlet was available. I visited with nearby neighbors(the first humans I had seen since beginning the trip) for a while before cooking dinner. As the sun dropped, the granite walls surrounding Evolution Lake turned to gold. I took photos of the lake, its outlet, and the surroundings until the light faded away. Next morning, I got an early start and headed down Evolution Canyon, past Colby Meadow with the Hermit rising in the background and through Evolution Meadow with its beautiful meandering stream. Sitting by itself above the magnificent meadows of Evolution Valley is The Hermit. The Evolution Creek crossing had been widened a lot by heavy runoff but the water never got above mid-calf. The trail steepened as I dropped down the canyon to its junction with Goddard Canyon. During my lunch break at the junction, I talked to a member of the French delegation to the United Nations who had developed serious blisters from small boots. I suggested he hike out and get a new pair of boots in Bishop rather than abandon his trip. He was the last hiker I would see until I got to Fleming Lake 24 hours later. On the four and a half day trip, I enjoyed solitude for all but a few hours. 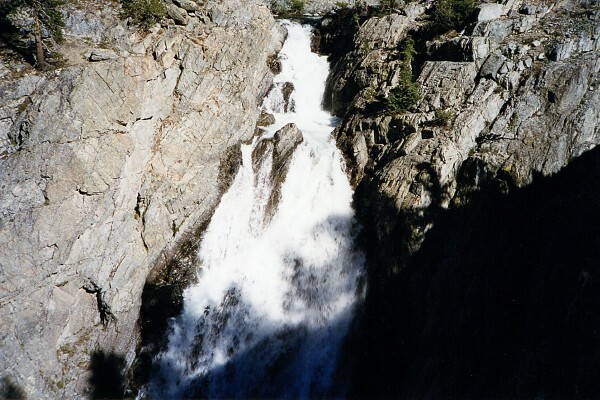 Falls of Goddard Canyon - One of several impressive falls in the canyon. 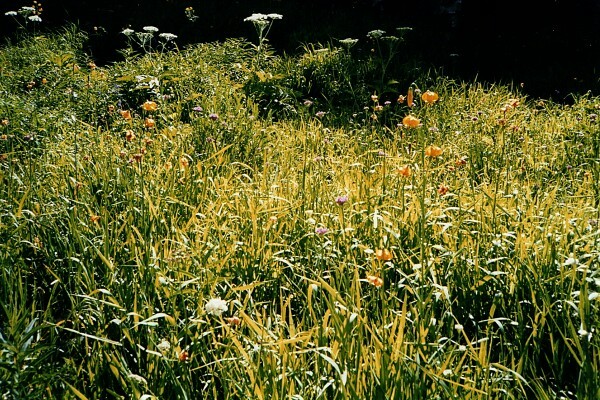 Goddard Canyon Flower Garden - This is the only place I have seen fields of Leopard Lilies. and other flowers, and more waterfalls. The trip took longer than I expected for I arrived at the turnoff to the Hell for Sure Pass late that afternoon. Had I not been familiar with the junction, it might have been difficult to find it, for there was no sign to show the way except for an arrow carved into a dead tree. 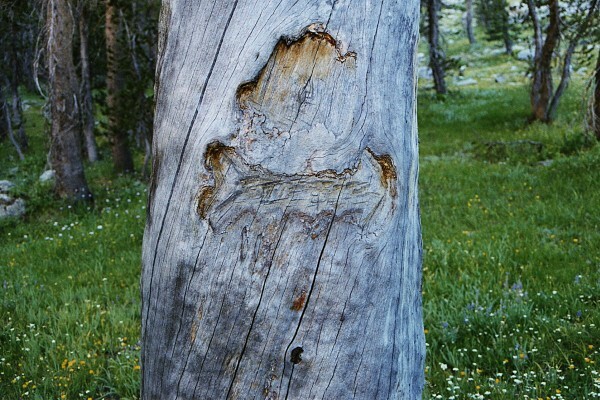 This arrow is the only sign on the Goddard Canyon trail pointing the way to Hell for Sure Pass. I hiked up the trail to the first water crossing and stopped for dinner. 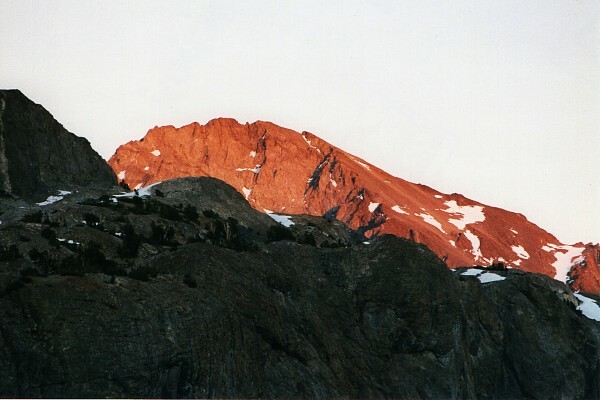 Mount Goddard changed from a black giant to a fiery red one as the sun left the canyon. The final day dawned clear and cool and I began the climb toward Hell for Sure Pass wondering if it would live up to its name from this side. Hell for Sure Pass from the East - At last, the pass. It didn't. The name must have been given for a different route, because the ascent was quite enjoyable. I arrived at the top at mid morning and was at Fleming Lake trail junction a little after noon. I noticed the first clouds of the trip forming feebly in the south. From there on out I met a number of hikers making their way into this exceptional wilderness. The next day I was back at school preparing for another year in the classroom.